Gondyke bought the Cougar from a goat farmer, who kept the then-primer grey car in a goat pen. It had a slipping automatic transmission and a too-small air cleaner, and looked like the perfect fun-car replacement for a Porsche 944 Turbo that was giving him grief. The intention was to just have a cheap V8 cruiser after several expensive years trying to keep a Porsche 951 on the road, but I ended up attending a rallycross with a friend that fall and I was hooked instantly. The next step was pretty simple. Why go out and buy a boring Subaru when there was a crudely painted two ton mass of bellowing V8 ‘Merica sitting in the driveway? ‘MERICA! I can’t blame him, to be honest. Rallycross is one of the most enjoyable things you can do with a car. The course is different every time, as it’s made of cones like it would be for an autocross. Of course it went autocrossing mid-build, though. But rallycross happens off the pavement, where even the biggest nose-heavy pig of a car can go sideways like a champ. It’s the place where you can live out your wildest Ken Block fantasies on the cheap in a rental Hyundai, if you must. Or in this case, a rad Cougar. The first steps were pretty standard for any project car: take off the fenders, door panels and trim for rust repair. Then Gondyke convinced a friend to help him paint it the cheerful orange. Note the larger air cleaner. He also went through and got the drivetrain running well again. The 351W Ford Windsor V8 engine was bored out by 0.030 inches for a bit more displacement, and got aluminum heads and roller rockers. It’s fed by a Holley 650 carburetor and of course, a larger air cleaner. One meaty cooling duct aimed right at the brakes—a necessity on a big, heavy car. The engine bay after Gondyke made some key upgrades. The engine mates up to a T5 five-speed manual transmission that Gondyke is surprised he hasn’t blown up, and a much stouter nine-inch Ford rear end with an Eaton Detroit Truetrak limited-slip differential. As with any project, though, there were some mishaps along the way. Custom parts guard the radiator, and also look cool. From there, Gondyke did a few things to ensure all his work wouldn’t be completely bent and scraped up on course. He welded in chassis reinforcements that he custom made for the car, made a custom stone guard and shroud for the radiator and added a huge aluminum skidplate to the bottom to protect the fragile bits. The entire lower half of the car is covered in 3M clear wrap, which Gondyke claims has done a surprisingly good job at protecting the paint so far. He used to have a layer of black plastidip on the bottom for “the awful looking Chip Foose two tone effect,” but found that he didn’t really need it—the clear wrap was enough. It is objectively horrible at everything. 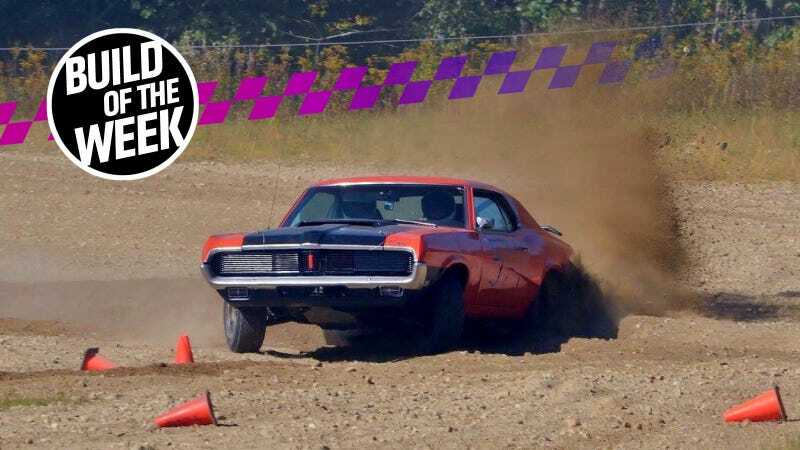 It skitters over the pavement at autocross. It wallows through rallycross courses as you desperately try to stay ahead of the four turn lock to lock steering. I can’t launch it hard at the dragstrip without risking shredding the poor T5 to bits. But I have never stepped out of the car without a smile on my face, so screw it—I’ll be competitive in something else. This kind of stuff is what makes it more than just the sum of its parts. These are the builds that I enjoy the most: the ones built for no other logical reason than for joy. It’s the same reason I’m adamant about building up an old, weird Volkswagen that no one’s heard of: it makes me laugh to see it on a race track. It doesn’t make sense, but happiness doesn’t have to. 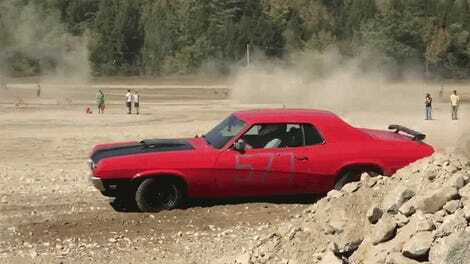 No doubt, there are some challenges to taking a big muscle car that was never meant to be a dirt machine off-road. “The rides home from events hours away are always interesting,” Gondyke said. He’s had headlights fall after at several events. Various events have ruined bushings, turned gently curved leaf springs into S-shapes, and bent tie rods, control arms, frame camber tabs, and drag links. The camber bolts for the lower control arms were never supposed to see side loads, so they shift wildly when going through ruts. On a typical rallycross course, I’m usually toed in or out by 2" or more at the end of each run and it becomes pretty much undrivable even at slow speeds. I have to scramble around with a tape measure and wrenches to get it fixed for the next run. One particularly enthusiastic second-gear shift caused him to rip the shifter off. “Aluminum threads with no helicoils were no bueno,” Gondyke said of what sounds like the most infuriating kind of repair. The horn got stuck on one run. Sometimes things just break, too, as they do with any old car. The horn shorted out at a rallycross once and was stuck on for the entire run. Gondyke said that another short turned his steering column into a “fireworks display,” forcing him to pull over at 4:00 a.m. and yank a cable off the battery en route to one event, lest his car burn down. I bring everything from wrenches and electrical tape to starter solenoids, spare tie rods, and even a spare carburetor to events, which are typically hours away. I’ve used most of the spares I bring at one point or another. I take pride in saying that she’s never been on a flatbed. I drive her home, one way or another. Now that is a feat worth taking pride in. Eileen the Cougar has since become a regular at northeastern rally events, so don’t be too surprised if you see it out on course. Well, okay—be a little surprised. That’s only expected when you see a big Cougar outside of its natural habitat. YO! Send Us Your Project Cars.